Build a successful career with IFB. – the best employer in the construction industry. I appreciate the flexibility and variety of my job at IFB and the employee-friendly environment. Flexible working hours and good office equipment complete everything. My work is appreciated by the IFB engineers and thanks to the great colleagues the working atmosphere is supportive and motivating. Please select the location and area of expertise that applies to you! 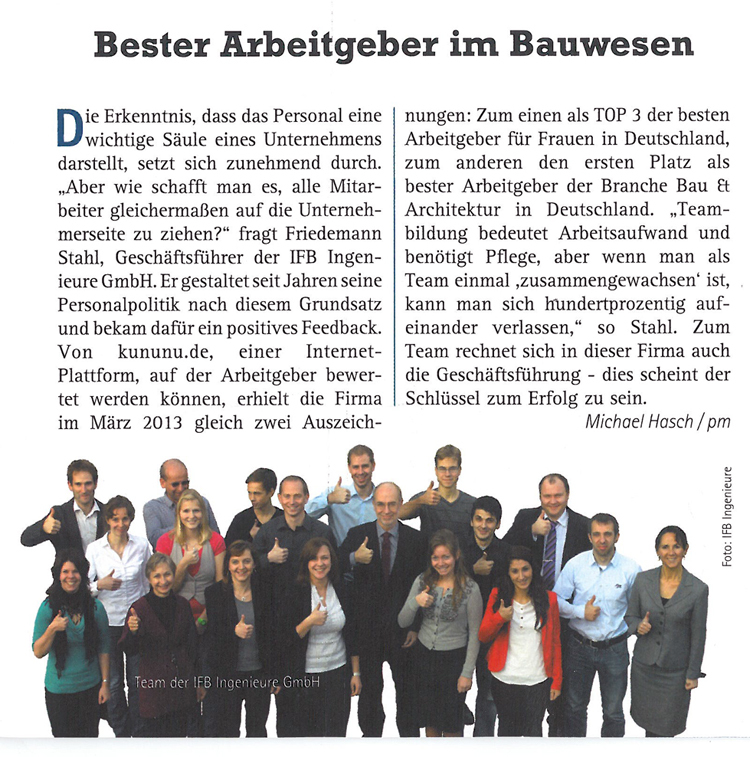 Unfortunately, our job offers are currently only available in German. We are the best employer in the construction industry. Thanks to our employee-friendly personnel policy, kununu.de voted us the winner in the ranking of the German construction and architecture industry and one of the top 3 most women-friendly companies in Germany. The overall health of our employees is important to us. That’s why we want to anchor more health in our company and subsidise your gym membership or gym courses. Talk to us! We invest in young people! Please contact us for student research projects, project work, bachelor and master theses! Of course, we are also interested in looking after students at other universities within the scope of our areas of expertise.